From classic 1930s film noir and Hollywood romance to international art-house and 21st-century sci-fi,The Movie Book brings the world's most influential films to life with its illustrative design. Unforgettable quotes, film stills, and original posters and memorabilia transport you to the world of each film, while narrative timelines and infographics explore central themes, characters, actors, and directors. Relive classics of the silent era, such as Nosferatu, along with wartime greats like Casablanca, transformative New Wave films such as Lawrence of Arabia and Easy Rider, and modern masterpieces like Do the Right Thing, City of God, and Gravity. Each movie is placed in the broader context of the industry and its key players, making it an invaluable resource for any film fanatic. The Movie Book zooms in on the best cinematic masterpieces of all time and is a must-have for anyone with a passion for films and the history of cinema. Big Ideas Simply Explained series uses creative design and innovative graphics, along with straightforward and engaging writing, to make complex subjects easier to understand. These award-winning books provide just the information needed for students, families, or anyone interested in concise, thought-provoking refreshers on a single subject. 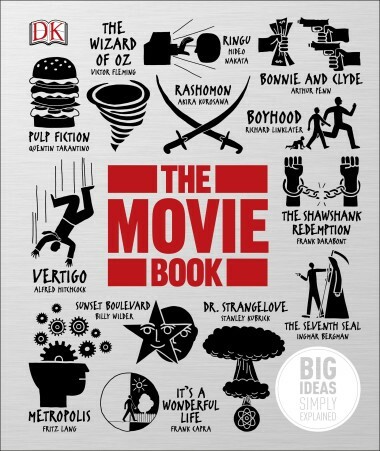 From the first movie to today's films, this book has it all! There were some movies I had not seen or even heard of before. I plan on going through the book and trying to watch as many as I can. The movies I have seen were referenced well in this book. Most of the greats were in here, and were very thorough with the information they gave regarding the film. From the story behind it, to who did what, and even notes on what happened in and around that time accompany some great photos of actual film footage, and photos of the people involved. I liked this book a lot, though other than a few foreign films there wasn't much I learned that was new. Still, it's a great conversation piece. As a movie lover, this book sounds fantastic. I am a TV addict, but can appreciate a good movie. This sounds interesting and I think it would make a great reference book. Thanks for sharing, Freda.